This chapter describes how you can add or remove licenses at CloverDX Designer. License Manager is designed to easily add new licenses and remove or view existing licenses. The manager is accessible in the main menu - select Help → CloverDX → License Manager. Figure 9.1. License Manager showing installed licenses. License number - number of installed license. Products - list of licensed products. Expiration - expiration date of the license. 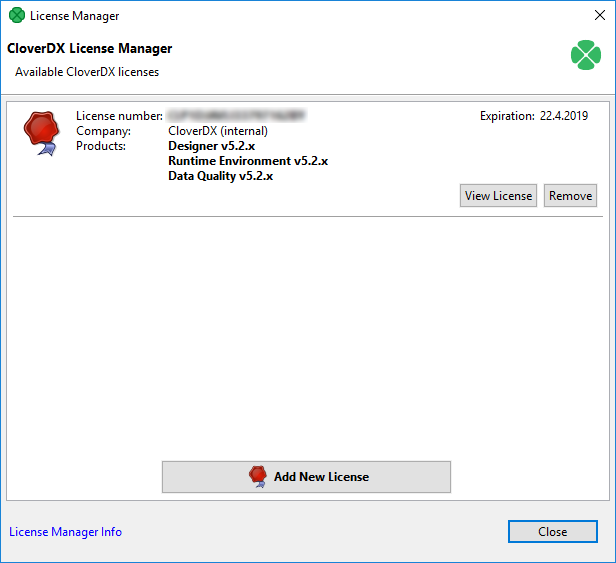 Open CloverDX License Dialog to view all available information about the license. Check available license sources. The license sources are shown after clicking on License Manager Info. Open Add New License dialog. New license can be added with the help of this wizard. Click Add New License button to start the process of license activation. See Chapter 8, Activating. Delete existing license. Remove button is shown if it is possible to remove activated license. Confirmation is required when deleting license.